James Moss of MOBKOI has been at the top of the Media League for some time. He has a strong pedigree with a top finish of 559 from a previous season. However he now has some competition. Whilst James has dropped down the rankings a bit, to 86,000, Drew Mark of ClearChannel is now 1 in the league with an overall rank of 44,000. In 2nd is Richard Myles of Flume at 59,000. Drew’s team looks great but, in contrast, he doesn’t have James’ proven experience and he has used his second wildcard this week (to great effect). 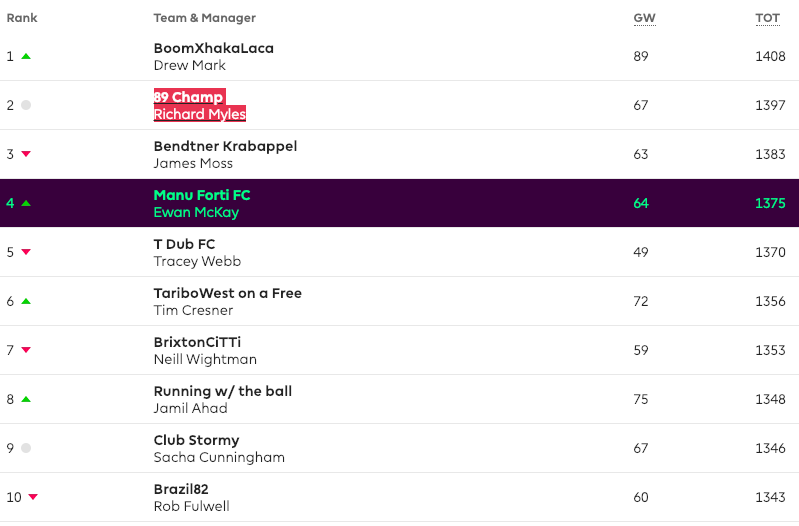 In came Salah, Sane, Pogba and more which led to 89 points this week and a GW ranking of 19,000. Wow. Can he keep it up? Richard is having a great season, his best so far. Since GW 2, he’s been in the top few hundred thousand managers and he’s steadily making his way towards the top 10K. Can you make it Rich? All of your chips are intact and that 2nd WC will surely be of great help to circumnavigate the double game weeks. After three poor game weeks between 20 and 22, James Moss took action by adding to last week’s -4 with a -12 to really change up his team. This improved the team but, with a -12 meant a GW rank of 1,774,964. To add to his pain, he brought in TAA only to have to ship him out again. Ouch. But then again, these things can happen when you move early on a player. No doubt James is hoping to avoid future hits for while. Still, you preferred a -12 to the WC, James? I guess we’ll see in time if that works out. I agree that I’d be reluctant to use it unless necessary ATM.